This past weekend I was able to take advantage of some free time, and photograph my GW giant. The giant was a surprise gift from my wife, who recalled me saying that every army could use one, and quite rightly, deduced that it would be a good purchase. 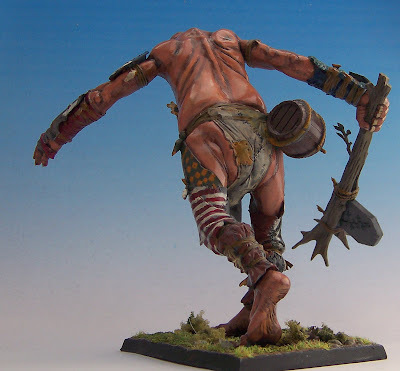 The giant is not only useful for several armies, but also fun to put together due to the huge number of bitz one can choose from to adorn him. Many hands, heads, and feet and even more decorative items are included. Particularly fun are a hand grabbing a screaming man, a man running away from the giant, and a dead cow to sling from his belt. Quite allot of kit for $45. It would, however, be good if the legs went together a little bit better (I had to use some putty to finish them off), and if there was another leg set option in the box, as a second giant is likely to look exactly the same as the first, even with the huge number of bitz. For $45 you would expect a slightly better fit, and a few more pose options, but this is GW we are talking about, so we got more skullz instead. 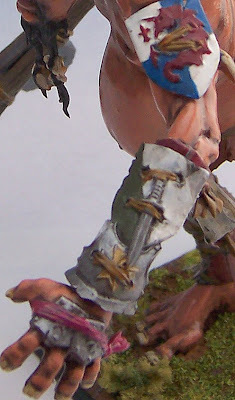 Since the giant is very large, it is a bit harder to photograph using standard miniature techniques. So please bear with the photos if they are cropped strangely etc. I painted his legs to look as if they were made from flags/tents etc, since that seems like a likely source of material for pants that large. The striped cloth was a pain to paint, and I am not sure that the results were worth it, since even the most careful painting ran afoul of the difficult folds in the cloth. The checked cloth looks passable in this small picture, but not up close. I used these to indicate both his general allegiance to DOW/Empire forces, and also to make his arms a bit more armored. This final picture is a closeup of his upper torso and face. The skin paint job is not that good, and is actually my third attempt. My first was obliterated by a too heavy ink job, and the second was too blotchy. This third is not quite as good as the first, but gets the job done. 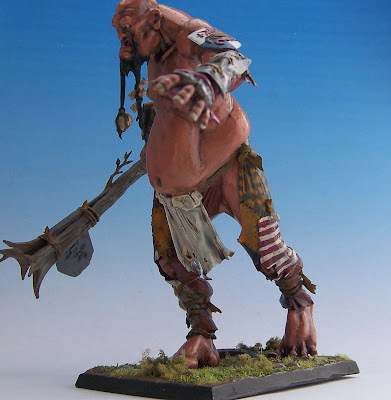 If I ever do another giant, I expect to spend some time reworking the legs, and probably will go with a chaos oriented giant, so that I can have one "good" giant and one "bad" giant. Cloven hooves, mangled hands, and a horned head will adorn the next one, while he will be armed with herdstone and a screaming man. Probably not likely in the foreseeable future, so do not hold your breath. Anyway, that is my giant. Next time, WFRP miniatures. I had intended for this post to be about Halloween related painting, but instead of going to the game store and getting Reaper's new flock of bats and painting them, I instead opted to spend some time with my wife at a club (after much arm twisting on her part). I had then intended to take advantage of a rare bit of sun during this rainy phase we are having here, and photograph some miniatures to discuss, namely my plastic GW giant, and a Reaper classic vampire, but the focus for my camera was sufficiently off that I ended up discarding all of the pictures. This is the case with most of my miniatures photography BTW, but this particular set was particularly poor, as I wanted to show of the paint job more than conversions or posing in this case. So plans foiled for a second time, let us then discuss the plan for the next few months of painting. 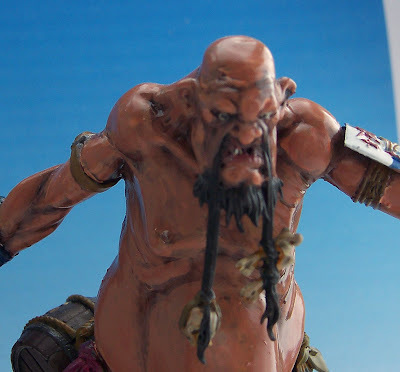 I am currently working on three main painting projects, to whit: finishing my playable Warhammer Fantasy Battle Empire army, cleaning off my painting desk, and the Fauxfly project, which will be discussed at another time. In terms of cleaning off my painting desk, I mostly accomplish this through moving partly completed items back in the boxes from whence they came, but I would like to actually, you know, paint some items, some of which have been "pending" since fall of 2001. Specifically Henry the VIII for my sister (Copplestone), a few more Fed ships (Dreadnought and Attack Cruiser), a 15mm PzIV, a 15mm Sd.kfz 251, and the Necromunda bounty hunter mentioned earlier. This also includes the plastic tiles from the new Mighty Empires, which I primered the other day. Fauxfly is a small project, but with a fairly large number of detailed figures, comparable to my WFRP figures (strangely enough). May include scenery/terrain/NPCs if required. Long term, I would like to paint my Warmaster 10mm Empire army, the Battle of Five armies boxed set, and while we are at it, every other darn thing I own. Since I have been generally better than usual at buying fewer miniatures than I am painting, it may happen. Someday. It must be said though, that ultimately, I will end up painting what ever comes to my fancy in the next few months, current plans notwithstanding. Report to follow as always as it occurs. As is common with me, my attention flits from one war gaming project to another in the space of a week or so. I believe this is the case because of my very long term researching, collection, building, painting timeline, which can stretch for years (still working on my first Space Marine company nearly 12 years on, with not much to show for it). Last few weeks I have been thinking about Necromunda, and running a campaign. I even went so far as to convert a figure for the game, and to examine my bitz stockpile to see what else could be made for the game. Then there was a brief period when Warmaster became the interest, and I paged through the Warmaster Ancients book while also thinking about my Battle of Five armies box. And now on to our current issue. The interest de’jure has become 15mm Napoleonics. As you probably know, Napoleonics are widely seen as the most pedantic of all war games due to the huge amount of information available on the period, the colorful profusion of uniforms, and the relative obscurity of some of this detail. The lack of dominance of a single game probably helps to keep the period muddled for gamers. 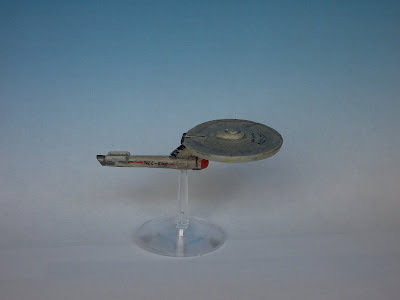 A few years ago, I became interested in gaming with Star Trek models, particularly those of the original series era (TOS). This interest was sparked by the humble Saladin class destroyer, created by Franz Joseph in the first "official" technical guide to starfleet forces, the Starfleet Technical Manual. Something about the single nacelle look. To game in this period, one is usualy directed to figures from Armadillo games, which produces both Starfleet Commander, and the infamous Starfleet Battles. However, not liking the prices of the metal miniatures, I went another route, and bought many Micromachine sets instead. Micromachines used to sell space miniatures cast in vinyl, three to a package, and thanks to Ebay, I was able to acquire them well after they became OOP. Once I had a suitable set of TOS era ships, I was able to create a few destroyers, which are detailed below. Side view of the destroyer. As you can see here, the paint job is a bit rough, which caused some problems with the ink. I think of it as light battle damage. I may forgo the ink next time, or paint another coat on top of it to rehighlight the areas currently marred by the blotchy ink. All three destroyers en route to some battle or exercise. I am also slowly working on a converted Federation Battle Cruiser (flat engine arrangement, more guns, less lab), and a Federation Dreadnought (three engines, larger engineering hull), but those will have to appear in the future. I have also repainted a Klingon D-7 Battle cruiser as a Romulan K-7, and a Romulan warbird to have more a accurate paint scheme. Unfortunately these too were afflicted by the blotchy ink, so do not quite look as nice as one might wish. Why Not National Army Painting Month? As you may know, there is a movement in the US called "National Novel Writing Month", where for the month of November, enthusiasts work together to produce a short novel of 50,000 words each. The idea being that the exercise gets everyone to write SOMETHING which is often the problem with aspiring novel writers, getting started. So why not expand the concept to Wargaming? Often, you hear people complaining that painting an army is just "too hard", and takes "too long". Now clearly this can be true, but the benefits of having a painted army on the battlefield are many as well. So to expand the concept of the National Novel Writing Month to wargames, why not challenge everyone to paint an army in a month? The rules could be simple, paint 120 Olly points worth of figures for a new army, using those figures you have been hording away in a closet somewhere with the intention of painting them "some day". [an Olly point is 1 28mm figure equivalent, so that a knight would be 2 Olly points, and a base full of 6mm soldiers would be just 1 point]. At the end of the month, everyone shows off their new armies, some will be poorly painted, some will be prize winners, but most importantly, everyone who participates has a new army to game with. At worst, you have some people who paint a few more figures than usual, at best, a newly painted army. Once presented with the large blank canvas of the sheild, I had to do something more than usual. 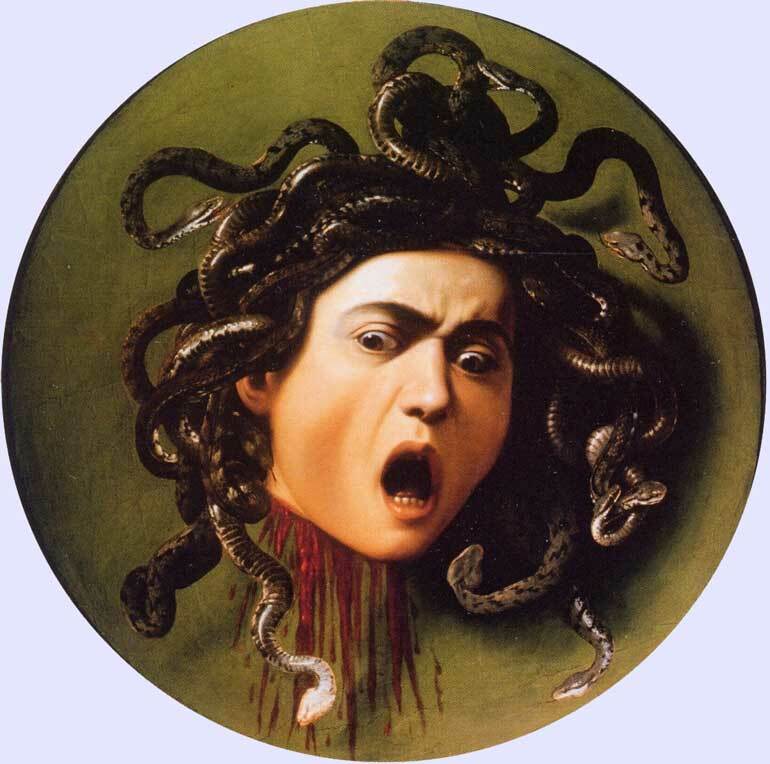 In this case I went for a rendition of Caravaggio's Medusa Aegis. While more ambitious than I probably should have been, I think that the final effect is quite nice. Above is my WHFB Weißenland army circa early 2007. Sad to say, not much progress made since this picture was taken. 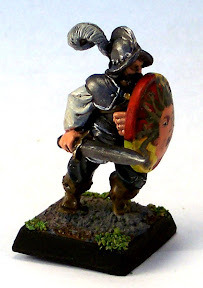 I have completed a 10 knight regiment of the Black Griffon, I have just started painting the next full regiment for the army (32 spears) and have painted a number of NPC types to populate the WHFRP version of this world, but no real progress. Around 1000 points depicted. Avoiding the appearance of a substantive post, I have instead opted to do a hobby round up, to list all the armies/periods/collections I have in the works or in boxes, both as a way to motivate myself, and as a way to entice interest from those few of you who read this and may fancy a game. As you may know, I am heavily into miniatures games, and like most miniatures gamers, am quite prolific in my ordering, and less good at painting and gaming. For those of you keeping track at home, the last such post was in 2006, since which time I have agreed to suspend and curtail miniatures purchases. The effect of this has been to focus my collections a bit more than would otherwise be the case, and with encouragement by the wife, I have actually painted a substantial number of figures in the last two years. Ancients: Greeks-(28mm) a few packs of Hoplites, roughly aimed at the early Peloponnesian war era. 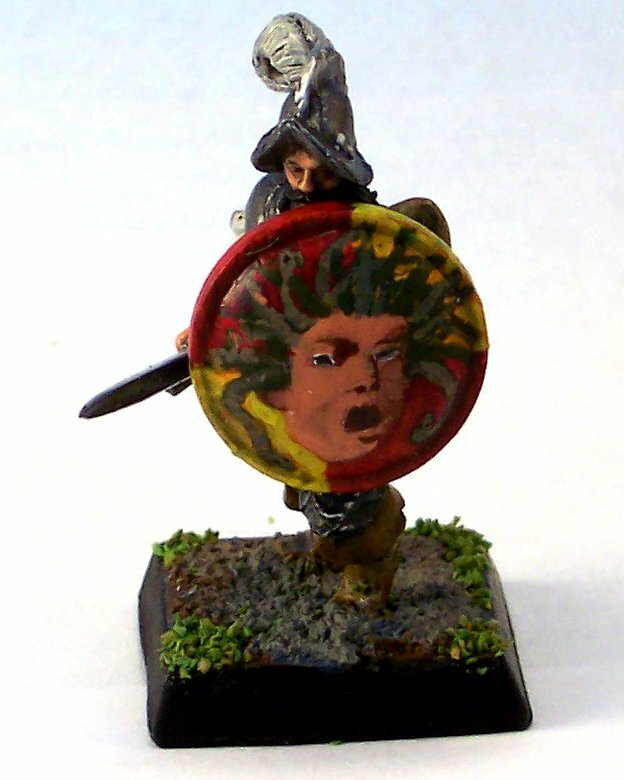 Would need substantial increases to reach a playable army using WAB, may be suitable for a small scale skirmish game. Renaissance: Conquistadores/Aztecs-(28mm) a pack of each, usable as testers for my Lord of the Pyramids Lord of the Rings rules adaption. Need to decide on square or round bases. Horse and Musket: Prussians: (28mm) a few packs of 1816 Prussians that I acquired for a song. May be usable for skirmish gaming. Easy to paint though. Modern Era: WWI Biplanes: (1/72) Two fighters at present, so sort of a skirmish level. Would ideally be expanded to a few flights per side, both to bulk up numbers, and to introduce all the bizarre variants that this war was known for. LotR: (25mm) Sizable Gondor army, smattering of dwarves and Rohan, and orcs of various flavors. Needs painting to finish things out. Battle of 5 armies in 10mm, still sadly in the box. Would like to expand this to work with other large battles of Middle Earth, but would need to get a sizable Gondor army to make that work. May need auxiliary units such as dwarf archers. Warmaster: (10mm) Empire army of a certain size, heavy on special regiments due to the vagaries of Ebay. Lacks terrain. Could be coupled with Bo5A terrain if carefully planned. 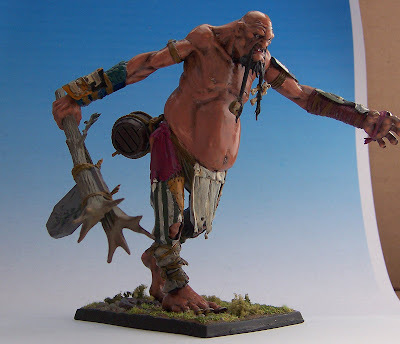 Warhammer Fantasy Battle: (28mm) Empire, Dwarves, Goblins, Ogres. 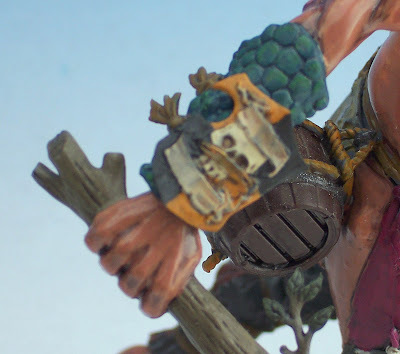 The Empire forces are creeping towards being painted, and I have a fair number of goblins painted as well, including the contents of the Battle at Skull Pass boxed set. 100’s of figures to go of course. WFRP: Warhammer fantasy role-play is a new interest, and I have managed to acquire and convert a few suitable figures. With a good number painted, I just need players… Could also mutate into a Mordheim/WH Skirmish game with little effort. Sci Fi: Dirtside: (6mm) I have painted a reinforced company of one faction, but no progress on the other four. Have a few gaps in the miniature collection as well. Terrain for this game is well in hand thanks to my custom resin cast buildings, but it needs to be painted and based. Federation commander: (1/3600) 3 TOS era Micromachines based fleets for this game. As pre-paints, these are mostly ready to go, but I have a few conversions that need to be painted. Would be good to own the real game, rather than using the tester rules to kluge together something playable. 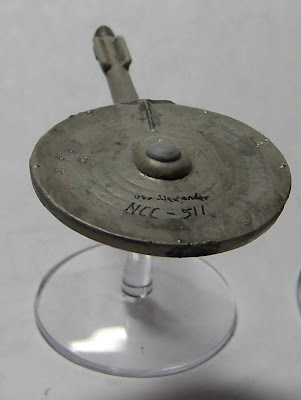 Need to build or buy Romulan and Klingon escorts to make the fleets balance out better. Warhammer 40k (28mm): Marines, Imperial Guard, Eldar, Tau, enough Kroot to form their own small army, Inquisitorial forces… My first game, I have tons and tons of material for this. Around a company of Marines are painted, just need to be finished to be usable. Absurd amount of Guard, which given the pending rules update, will probably be mostly unplayable. I also have a fairly random collection of 2nd edition orks and Chaos figures, with a fair few Genestealers, but these are not playable in the current game, and no where near finished anyway. Necromunda: Recently bitten by this bug, I actually have a fair number of Necromunda figures kicking around, as my Guard army was originally intended to be derived from Necromunda. Unfortunately, most of my figures are fairly random, so no complete gangs. Need Juves in particular. Paints quickly though, so if players were found, it could be done. Terrain is a major factor in Necromunda, but as of yet I lack any. Could be combined with 40k terrain. Inquisitor: (54mm) several warbands worth of miniatures, mostly heavily converted, not a single one finished or painted. Needs terrain, and with the larger scale, this means larger terrain. I think that the Mechanium building for 40k should work , but is costly for large scale gaming. Fauxfly: A bit of a surprise here, to be discussed later. BFG: Small scale space ships, of which I have a full Imperial fleet, and a Chaos fleet which lacks escorts. Starwars Miniatures: (32mm) a veritable horde of figures, mostly aimed at getting a skirmish/Role-Play game together. As pre-painted figures, very little work is needed to finish these, baring a few paint touch ups and conversions. Needs terrain. I think that is it. A substantial amount to be sure. All in all, I need to maintain the relative lack of purchases, and concentrate on painting something to completion. (or at least a playable army). That probably means Empire, as I am about 90% of the way there. I just need to finish up the spear regiment, and check the current army book for an appropriate point level to see if I need to paint more than that. All of my forces need terrain, in particular trees, as they can be used in many scales and games. Maybe a sack of them should be a Christmas list item. I have recently begun thinking about contributing to the hobby in a more meaningful way. The Hobby you query? Miniature wargaming is the hobby in mind, although I also am interested in computer games, board games, and scale models, all of which may appear here from time to time. In any case, watch this space, there ought to be more to come.